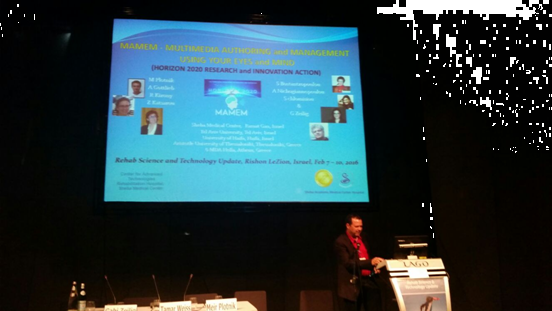 In a recent convention named “Rehab Science & Technology Update” which took place in the city of Rishon Letzion Israel, in the beginning of February 2016, the MAMEM project was introduced by Dr. Meir Plotnik, one of the investigators from the Center of Advanced Technologies in Rehabilitation (CATR), in behalf of the Sheba medical center. The project was presented using a presentation and a short talk during a didactic session in which the investigator was an invited speaker. The outline of the project and its importance was explained to the audience and later there were a few questions about it. Generally, there were positive reactions towards the MAMEM project and later the investigator was approached by several fellow researchers inquiring about it.